Randy Oliver: "ALL OLIVER - ALL AFTERNOON!" Thanks to the good offices and kind generosity of the Idaho Honey Industry Association, Association Management Group and the Red Lion Downtowner Hotel, beeks from Idaho, Oregon and Utah recently experienced a wonderful and unique session with Randy Oliver in Boise. On Friday, December 5, Randy was in Boise at the Red Lion Downtowner and spent the entire afternoon speaking with the 100+ hobbyist/sideliner contingent. True to form, a riveting discussion on mite management dealt with the detection and management of mite loads. There's no good way to kill Varroa destructor mites without poisoning your bees or poisoning their home, but those pesky parasites can be effectively managed and successful, long-term beekeeping is certainly possible. Randy generates a top-notch article every month in the American Bee Journal (ABJ - "the oldest English language beekeeping publication in the world"), and he is a frequent contributor in national bee blogs. If Randy's presentation has piqued your interest in improved beekeeping, continue to follow him at ScientificBeekeeping.com and through the ABJ. This event was sponsored by the Treasure Valley Beekeepers Club. Hat's off to all the Club volunteers that invested their time and energy to bring this hugely successful event to the local beekeeping community. 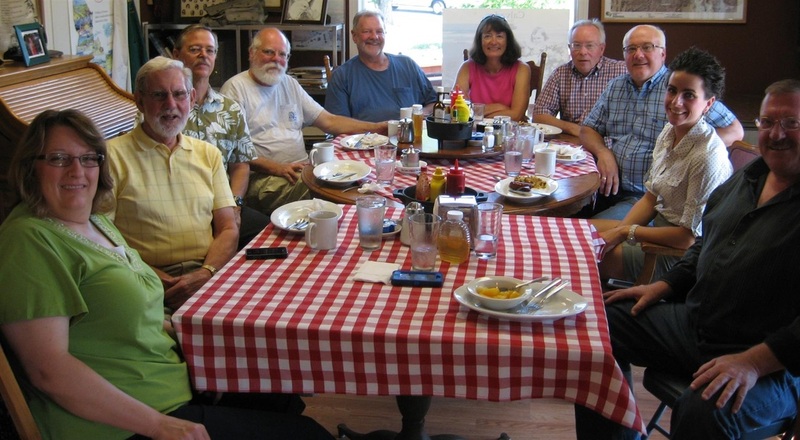 Kim Flottum, editor of Bee Culture magazine (http://www.beeculture.com/) visited the Treasure Valley to help the Treasure Valley Beekeepers Club celebrate National Honey Bee Day over five days in August. His first stop was to check out the BSU blue turf (Thanks, Melinda), then he led intrepid Club members on an inaugural, downtown Boise Pub Swarm (Thanks, again Melinda), then led the Kid's day learning session at Boise City's Foothills Learning Center (Thanks, Carolyn & Carole), including the presentation of a check from the Club to the FLC (Thanks, Chad & Doug), conducted Apprentice exams for the Oregon Master Beekeeping Program (Thanks, Jan), headlined at the 1st Annual NHBD Barbeque (Thanks, TVBC), rang the opening bell at the Capital City Farmer's Market (Thanks, Karla), presented a talk on Honeybee Nutrition at the Foothills Learning Center to members of the TVBC and presented a ceremonial check to the Washington State University Honey Bee Program (Thanks, again, Jan & Chad), attended a special honey-themed epicurean luncheon at the Western Idaho State Fair plus presented two different talks on Beginning and Beyond Beginning Beekeeping at Western Town at the Fair (Thanks, Teresa and crew), waxed eloquent around the Duesmanville (Thanks, Liz & Kebin) campfire, presented his "On the Radar," and prognostication to a full house at Boise State University (earning his "Idaho Bucket" and thereby satisfying his self-imposed Bucket List requirement - Thanks, one more time, Melinda), convened with Ron Bitner, Jon & Golden Millet (Thanks, boys) overlooking the Snake River and enjoyed some of Dr. Bitner's finest, and finally (whew!) closed out his five day Idaho run with breakfast at Tom Sweeney's (Thanks, Frank) and a trip to look at indoor storage firsthand at the Honey Store in Fruitland, ID (Thanks, Shilo & Nick). Details of Kim's Bucket Trip follow.